Molotow markers and spray paints are made in Germany to the highest specifications and are suitable for both fine art and street art purposes. Perfect for fine artists and for those who work indoors, the One4All Acrylic spray paint range uses a high-quality acrylic dispersion. Because water makes up approximately 85% of the total paint volume, One4All cans are perfect for those who are trying to minimize their use of solvents. 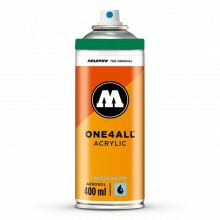 Jackson’s also stock a wide range of One4All acrylic markers and acrylic UV Varnishes.